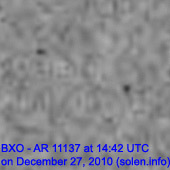 Last major update issued on December 29, 2010 at 05:25 UTC. The geomagnetic field was quiet to minor storm on December 28. Solar wind speed ranged between 304 and 404 km/s. A CME observed on December 23 was the likely source of a brief and significant increase in geomagnetic activity after 10h UTC. Solar flux measured at 20h UTC on 2.8 GHz was 80.7 (down 5.8 over the last solar rotation). The planetary A index was 13 (STAR Ap - based on the mean of three hour interval ap indices: 13.3). Three hour interval K indices: 00015431 (planetary), 11125432 (Boulder). Region 11137 was quiet and mostly unchanged. 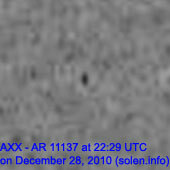 Region 11138 developed early in the day, then decayed slowly. 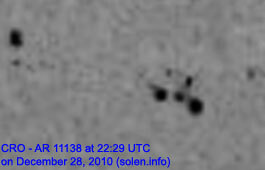 A small warm plage area has rotated into view near the southeast limb. 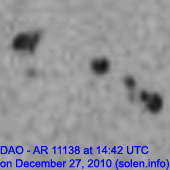 A single, tiny spot was observed earlier in the day and early on December 29. 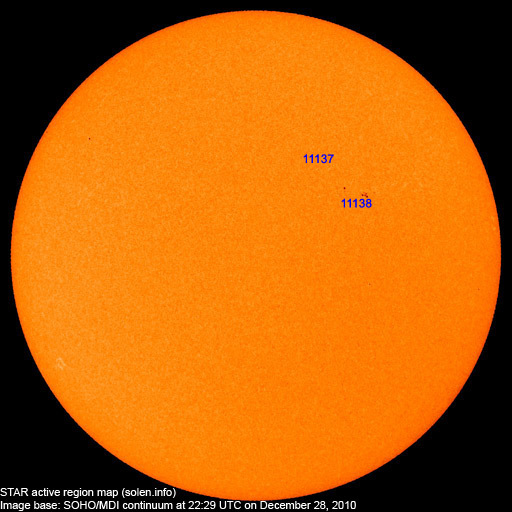 December 26-28: No obviously Earth directed CMEs were observed in LASCO or STEREO images. 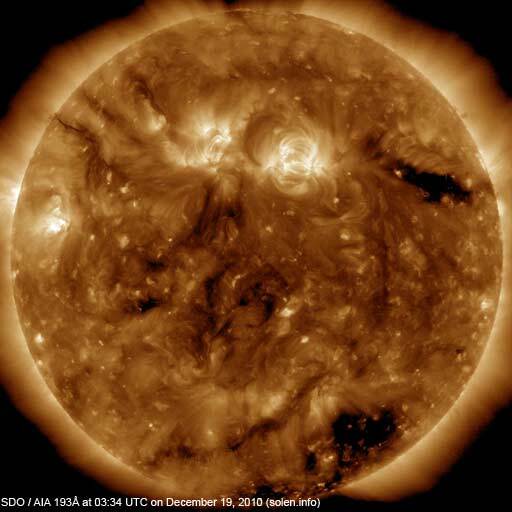 The geomagnetic field is expected to be quiet to unsettled on December 29 and quiet on December 30-31.